Whether you prefer the antique look and feel of a traditional kitchen with elegantly carved moldings, or the chic sophistication of marble and chrome finishes, Sears Home Services has the quality products and design ideas to make your dream a reality. We offer a variety of choices for your kitchen renovation, including cabinets or cabinet refacing, countertops, flooring and accents to please the aesthetic qualities you want in your dream kitchen. Worried about the cost of kitchen remodeling? Don’t be. We have a number of options to fit almost any budget. Plus, we’ll give you a free estimate, so you’ll know what to expect. We’ll also provide you with your own personal Project Manager, who will work to keep the project within budget. There’s also our satisfaction guarantee, so there’s no risk to you. KITCHEN CABINETS: Choose from a variety of styles and colors for a new installation or ask about our cabinet refacing option. KITCHEN COUNTERTOPS: Sears offers an array of countertop styles, such as customized, formal, contemporary, or trendy - all available in a variety of colors and textures. Granite – This surface is a favorite. American Granite Countertops are chemical resistant, stain guard protected, GREENGUARD® certified, radon/radiation tested and equipped with thermal stability. Quartz – This surface features a consistent pattern available in many colors. Some additional benefits include scratch resistance, scorch and stain resistance, strength and reliability. Our Quartz countertops are engineered to provide the highest quality and come with a limited lifetime warranty. ACCENTS: Accents truly add the finishing touches to any kitchen remodel. Sears has a variety of quality faucets, sinks, door handles and backsplashes to complete your project. 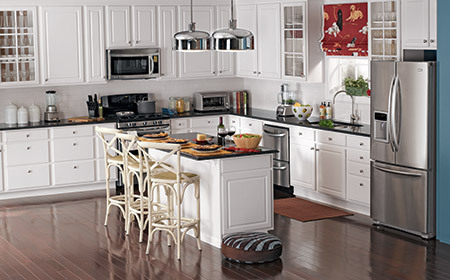 Save $500 on kitchen remodels of $1,500 or more. Offer valid through 5/4/2019. Not valid on prior sales or in combination with any other offer. Purchase requirement before taxes and after other discounts and must be made in a single transaction. ^Ask your Sears Specialist for written limited warranty details.